Oh, you knew it was coming sooner or later. Did anyone really think I was going to go the whole year without acknowledging the biggest ever stir in the breadmaking blogosphere, the phenomenon (to use a tired descriptor) that launched a million ovens to unexplored panary shores? Feh. Does the world really need another treatise on no-knead bread? It was quite amazing, the reaction to this simple recipe. Within days of publication, hundreds of no-knead posts appeared across the internet, and that Thanksgiving in New York City, there was a run on Dutch ovens and instant yeast that lasted through Christmas. My own father sent me the recipe, a man who has about as much interest in baking his own bread as a cat does: they might enjoy it very much, but it’s probably not going to happen. And really, when you get right down to it, that little snit has a point. Don’t get me wrong, I think no-knead bread is fabulous for what it’s done, for the quality of bread it has brought to American home cooking. But objectively speaking, perhaps the crust might be a mote too thick, perhaps the crumb could be more open, perhaps the flavor could be a bit more complex. All these nitpicky things aside, you will perhaps never find a bread so easy to make that produces such excellent results. Enough has been written about the characteristics of this bread, so I’ll spare you that much. 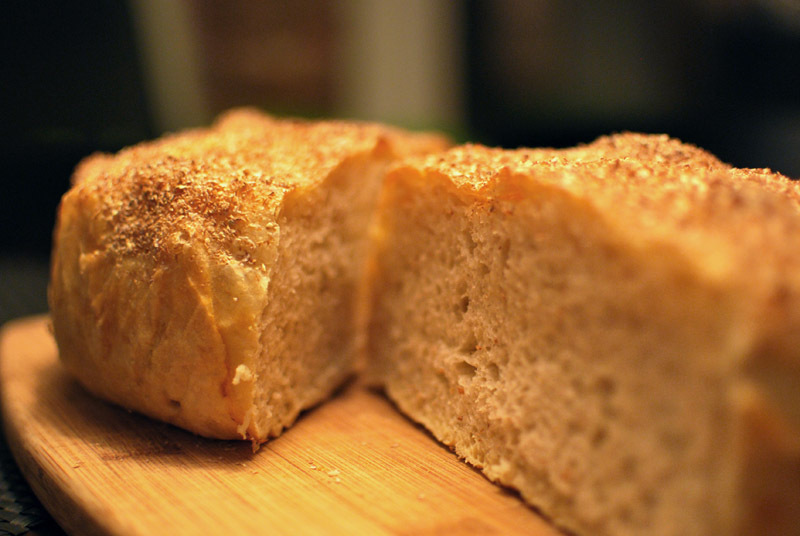 (Is anyone reading this blog really a stranger to no-knead bread?) I have made modifications to the original recipe, namely that I use parchment instead of cloth as a couche for the dough to rise on. Maybe I’m the only one, but I never seem to have luck rising bread on fabric, no matter how heavily floured. It always sticks. So I use parchment instead, which here has the added benefit of not having to flip fragile risen dough upside down into the precise center of a 450º F pot. Forgive my impudence, but I can’t really imagine why you’d do it any other way. 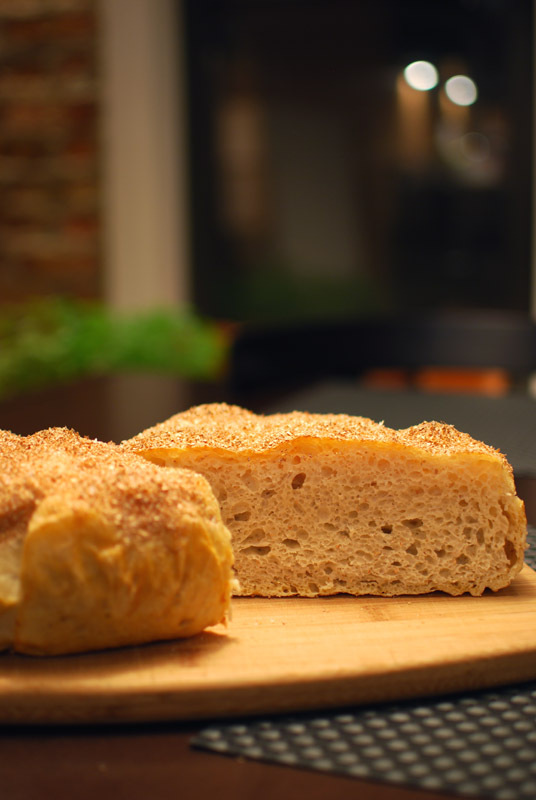 Today, I’m featuring the original no-knead bread, with the aforementioned change in technique. In the following days, I’ll discuss variations on that theme, for those of you who (like me) just can’t resist fixing what ain’t broke. Stay tuned! 2. 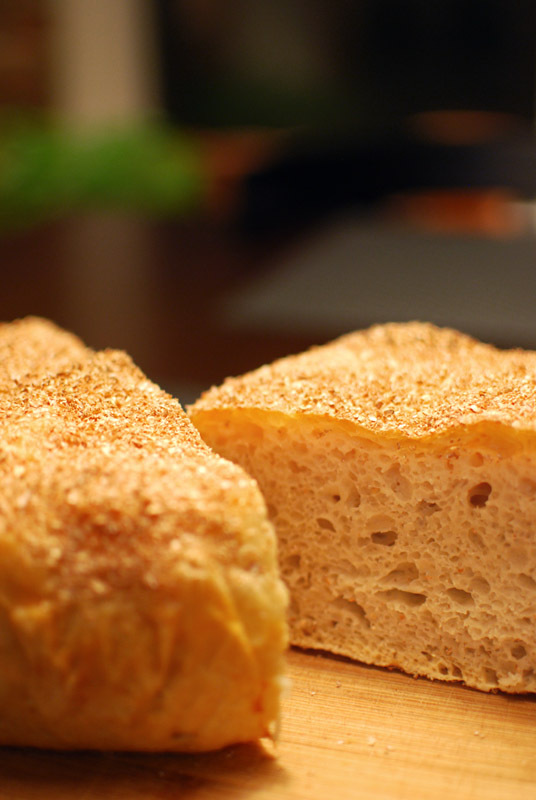 If you don’t have bread flour on hand, you can certainly use all-purpose flour in its place. In that case, you should use 13½ ounces instead (which still measures 3 cups).